It was about 3 AM, and I was coming back from playing a gig with my band downtown. I had my guitarcase in hand. As I walked through the avant-garde residential section of Winnipeg, I turned from Wolseley St. onto Home St., I saw something unusual in front of the house on the corner I had never seen before. Standing, illuminated by the moonlight, against the darkness, was this tall, shaven-headed person dressed in white robes. I didn't know what to make of him, at first, but did not want to be impolite by staring, so I pretended not to see him. Surprisingly, he called out to me and asked, "What kind of axe are you playing ?" I was very surprised to hear this type of vernacular coming out of the mouth of someone that looked like a monk, especially since the term axe was generally only used amongst modern musicians at that time. He immediately took me off my defense, and I was more than pleased to cross the street, open my guitar case on his lawn, and proudly display my double cutaway Gibson-Epiphone Riviera. I told him that it was the same model that you saw the pictures of George Harrison and Keith Richards using from those earlier albums, and it was a collector's item. He complemented its natural finish and mentioned that George Harrison was a lot into the Bhakti yoga that he was into. I immediately liked this person! I found him to be very relaxed and kind. Not only did he like my guitar, and took an interest in me, but he was also into one of my big influences in life, George Harrison, and all the intrigue I had surrounding his trips to India. He told me that he was also a musician, and had played soprano saxaphone. He was into all the dissonant sounds of John Coltrane who had put out albums like Om, Meditations, From Here to Eternity. Just to understand that stuff, I considered him to be pretty elevated! It was very unusual music and had a metaphsyical aspect to it. He explained that he and two other friends had left their band to join the Hare Krsna Movement! I had heard the shocking story that three of the most talented musicians in the Midwest of Canada had dropped out of their succesful band to become Hare Krsna monks, and now I was meeting one of them! I saw that he had a little bag around his neck that he kept his hands in and I asked him what it was. 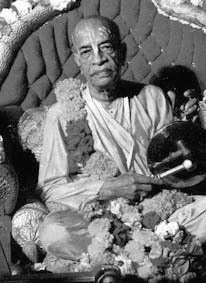 He pulled out his japa beads from it that he explained he chanted the Hare Krsna mahamantra on everyday, and explained how beneficial it was to chant. I was interested. He invited me to attend the Sunday Love Feast, and I promised that I would come. I told him my name and he told me his name was Nandikesvara dasa, but that I could just call him Nandi for short. That suited me fine. I was thrilled to have a new friend who was a Hare Krsna yogi! In the meantime, I purchased a record album of the Bhagavad gita, with an Indian man speaking some verses from the Gita. I enjoyed the droning sounds of the sitar accompanying verses like, "While contemplating the objects of the senses, one develops attachment to them. From attachment lust arises. From lust, anger arises...." and so on. The record was preparing me for the book. intersting! At the other end of the double room was what I thought might be an altar. It was so full of flowers, that at first, I didn't even perceive that there was anything that was there to be worshiped. It was just an ocean of color! Everyone was getting into this transcendental groove, and their was a crescendo of music and rhythm building up along with this chanting. I was really getting into it. It was very contagious. Everyone was dancing, and some started to even jump in the air! My heart started to feel very joyful from this experience. I had been in bands for a few years, and the tendency was for every musician to be into his own false sense of ego, but not here. Here, everyone was dedicating their song to the glorification of God, Krsna. So I started jumping and chanting too, feeling completely uninhibited and started to feel more and more blissful every minute. I didn't want it to end!